State geologists analyze projected impacts of Cascadia Subduction Zone earthquake, magnitude 9.0, and expect tens of thousands of casualties in the tri-county area, and massive numbers needing emergency shelter after being forced from their homes. The "Big One" will devastate Portland even more than scientists previously expected, according to a new state geologists' study of how a major earthquake will affect the tri-county area. The study released Thursday, March 15, found that a magnitude 9 earthquake centered off the Oregon Coast in the Cascadia Subduction Zone would cause tens of thousands of casualties in the Portland area, displace tens of thousands of residents from their homes, and cost tens of billions of dollars in building damage. 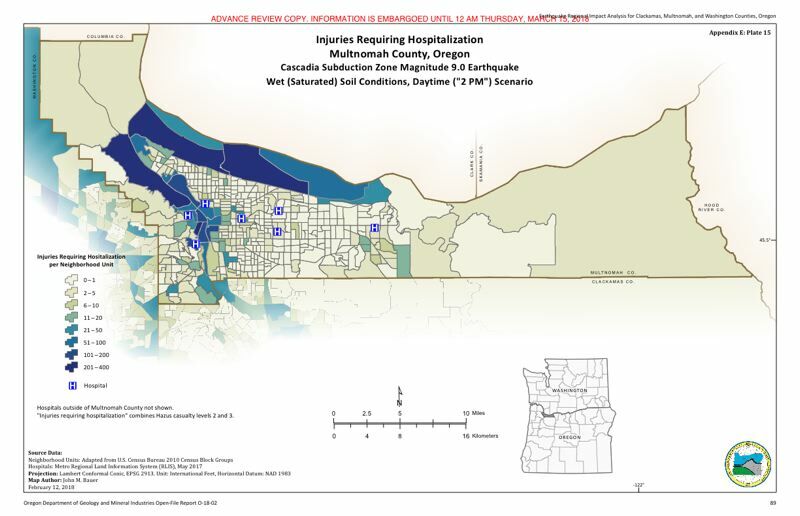 In Portland alone, the study calculates 119 to 896 immediate deaths from a major Cascadia earthquake, depending on when it occurs, plus hundreds to thousands more life-threatening injuries and people requiring hospitalization. Throughout Multnomah County, 302 to 677 buildings are projected to collapse. The numbers aren't much better for Clackamas County. There, according to the report, a large subduction zone quake could damage about 54,000 buildings (between moderate and extensive damage), destroying between 2,200 and 6,200 buildings. If the region is hit with a large quake centered in the West Hills, the devastation could be much worse. According to the report, Clackamas County could see about 110,000 buildings with some degree of damage, and between 12,000 and 24,000 structures that would be destoryed. Deaths and injuries from the quake could be limited by the time of day and the power of the seismic shaking, according to the report. 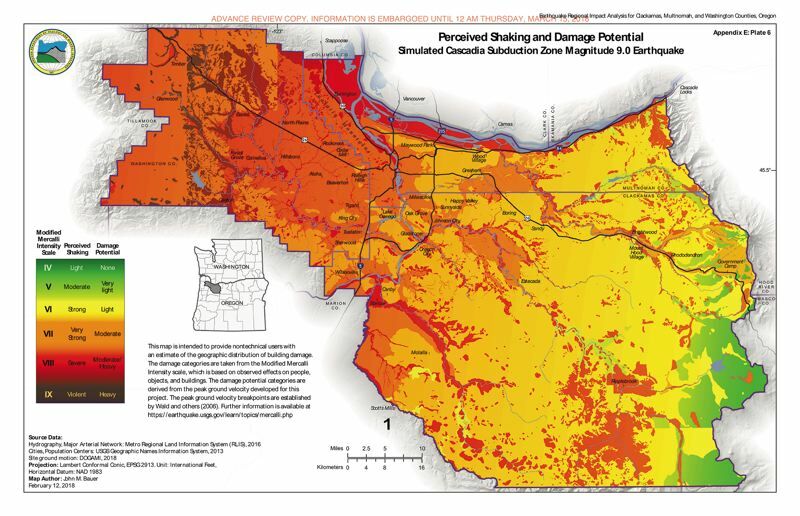 If a subduction zone quake happens during the day, between 100 and 2,000 Clackamas County residents could be injured or killed. If it happens at night, the numbers would be much different, with about 1,000 people injured or killed. A West Hills quake that hits during the day could injure or kill between 500 and 10,000 people, according to the report. If it hits at night, between 100 and 4,000 people would be injured or killed. 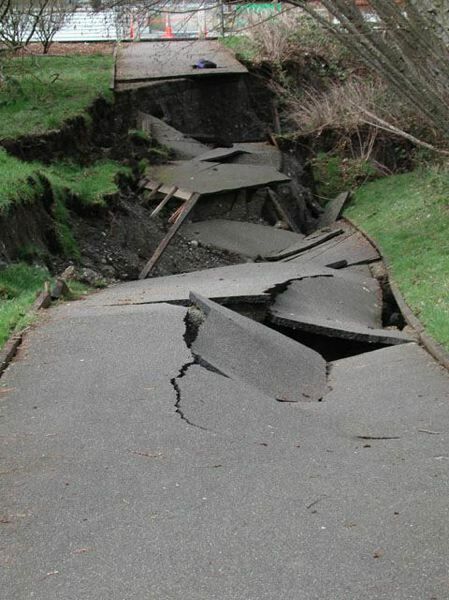 "Although damage estimates vary widely throughout the study area, no community will be unharmed," concluded study authors John Bauer, William Burns and Ian Madin of the Oregon Department of Geology and Mineral Industries. 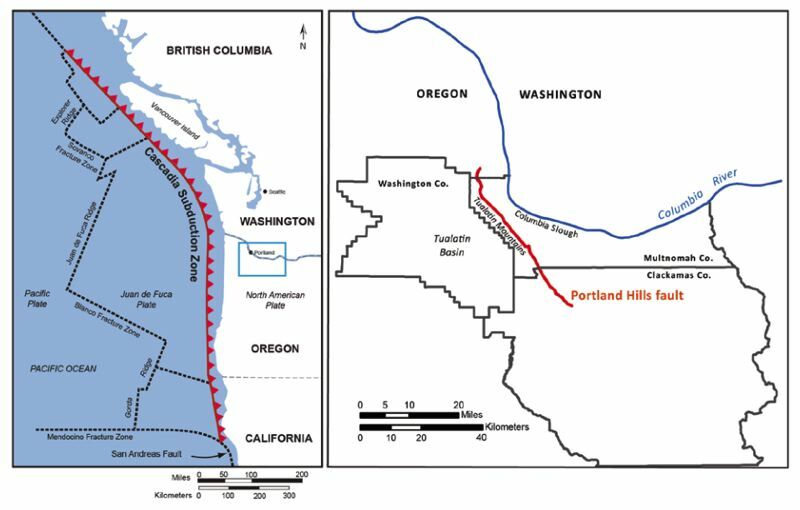 Though considerably less likely, an earthquake of magnitude 6.8 epicentered in the fault below Portland's West Hills would be even more catastrophic locally — causing more than twice the casualties and damages — according to their study. That would prove more devastating than an offshore Cascadia earthquake for people living within 15 miles of the fault, scientists concluded. In a major quake centered in the West Hills, as many as 120,000 Multnomah County residents could be displaced from their homes, or nearly one in six people. Recovering from a Cascadia earthquake won't be just a matter of putting out fires and stemming floods. There will be region-wide challenges to restore power, bridges and freeways, provide emergency medical care and assure food and water can be delivered. It will take months just to inspect homes and other damaged buildings to see if they're safe to occupy. Meanwhile, many will have to find other shelter, and some work places will have to be closed or relocated. The new study, while showing more severe impacts than previous estimates, didn't bring any surprises or point to any new preparation efforts that haven't been considered before, said Dan Douthit, spokesman for the Portland Bureau of Emergency Management. "We've already been expecting significant damages," Douthit said, "and every year that goes by, we get more and more prepared." Emergency planners still will focus on the region's greatest vulnerabilities, including more than 1,600 unreinforced masonry buildings in the city of Portland. "We know that unreinforced masonry buildings are likely to collapse, especially during a Cascadia Subduction Zone earthquake," Douthit said. "Those pose an immediate life safety risk for people in them and people walking by during an earthquake." Scientists now calculate there have been at least 40 large-magnitude earthquakes over the past 10,000 years along the 600-mile-long Cascadia Subduction Zone off the coasts of Oregon, Washington and Northern California. The most recent one occurred in 1700, and one study calculated there is a 15 percent to 20 percent chance that another one will occur in the next 50 years off the central and northern Oregon Coast. The Portland Hills fault is directly beneath downtown Portland and extends into population centers of Clackamas County, so local damages could be much greater. However, there have been only two ruptures there in the last 15,000 years, according to the study. Much of the damage from an earthquake depends on its severity and when it occurs. There will be fewer people injured if one occurs at night while people are sleeping, as wooden-frame homes are about the safest type of building construction during earthquakes. Quakes occurring during the daytime in the rainy season, when the soils are wet, will cause the greatest harm. In the city of Portland, a major Cascadia quake could cause 675 deaths, life-threatening injuries and hospitalizations if it occurred during a late night during the summer. If the same quake occurred during the day in the rainy season, the number of serious casualties would jump to 4,549, according to the study. Many minor casualties suffered during a quake could be addressed via simple first aid. The study points to the need for more people to get trained in first aid and how to respond to emergencies in their neighborhoods, Douthit said. Such training is provided for people volunteering with the city's Neighborhood Emergency Teams. Those volunteers can take some of the load off hospitals, which are likely to get overwhelmed during a major quake. As bad as conditions will be in the tri-county area under either scenario, it will be far worse on the Oregon Coast should there be a major Cascadia rupture. "A tsunami danger from a Cascadia earthquake has the potential to kill more people than the ground shaking in Portland," Douthit said. State geologists plan to release a second phase of their study next year, charting the potential impacts to Clark County, Washington, and Columbia County, Oregon. Low range is if the earthquake strikes during dry soil conditions; upper range is for saturated soil conditions. Includes estimated deaths, life-threatening injuries and people requiring hospitalization. Lower number is for evening earthquakes under dry soil conditions; higher number is for daytime quakes during wet season.